I spent a month mammal watching in S.E. Asia during the early part of the rainy season in September 2004. There were plenty of animals to see, though wherever I went people would tell me that mammals (or at least the ones I was looking for) were easier to see during the dry season. But I suspect that is true only of certain species. I’d been told the opposite when I had visited Thailand during the dry season! Perhaps, because the questions I asked related only to the species I hadn’t seen, the answer might be expected…. In Borneo, most trips are only possible as tours, though I hired a car and traveled to Mount Kinabalu and Poring on my own. I spent two nights here and stayed at the Park HQ, rather than the Royal Mulu resort, which was a good choice, because it was much more convenient for walking the trails around the park (after some negotiations with the park staff I was allowed to spotlight around the park on my own, so long as I registered my movements with security). The spectacular exit of two million Wrinkle-lipped Bats from Deer Cave, followed by some Naked Bats (larger with an audible echolocation) was a spectacle worth seeing. 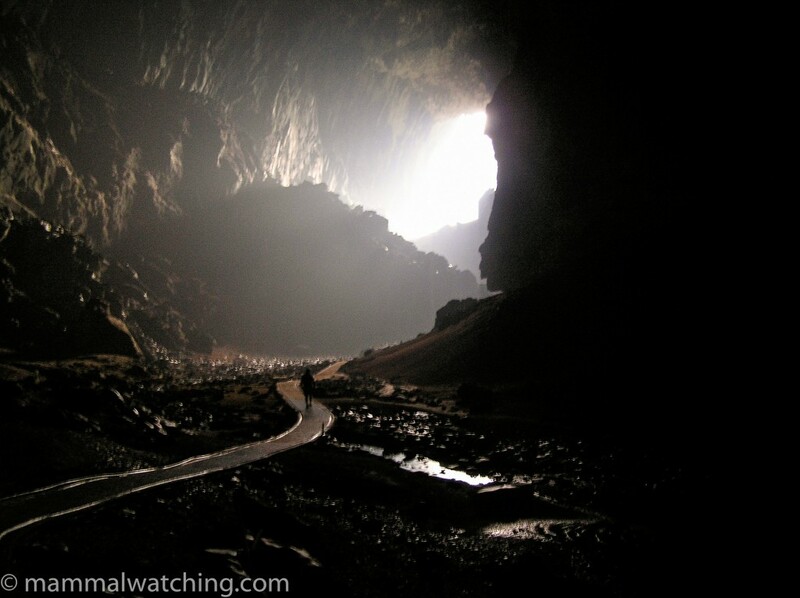 The long stretches of board-walk along the trail to Deer Cave, and the start of the trail up Mt Mulu made for excellent spotlighting potential because you could creep along silently. That said, I didn’t see a huge amount. About 500 metres along the mountain trail I saw my first Moonrat, seemingly oblivious to the spotlight. I also saw a Leopard Cat going into Deer Cave at dusk. 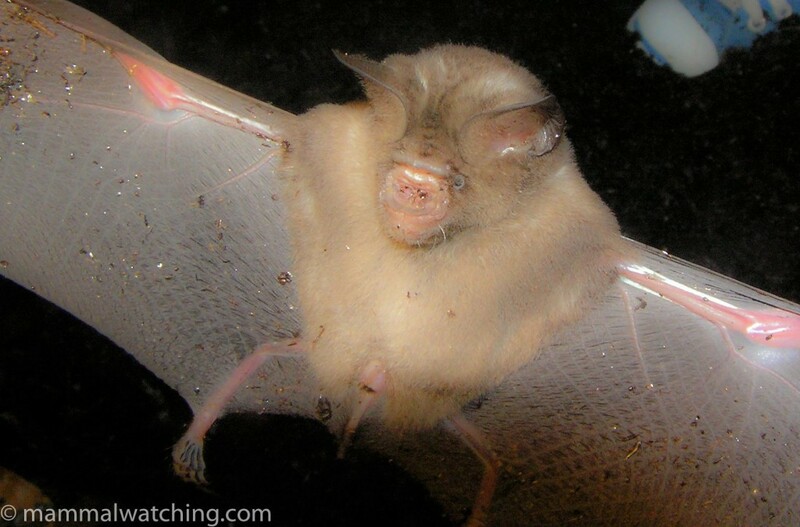 Inside the caves – apart from the Wrinkle-lipped Bats – I saw a few Diadem Roundleaf Bats, and several bentwing bats (species unknown), that were roosting in weep holes in the ceiling in Lang Cave. I also saw what I think were Naked Bats flying around Deer Cave at dawn. A Black Flying Squirrel was in the tree next to the security desk at Park HQ at about midnight. 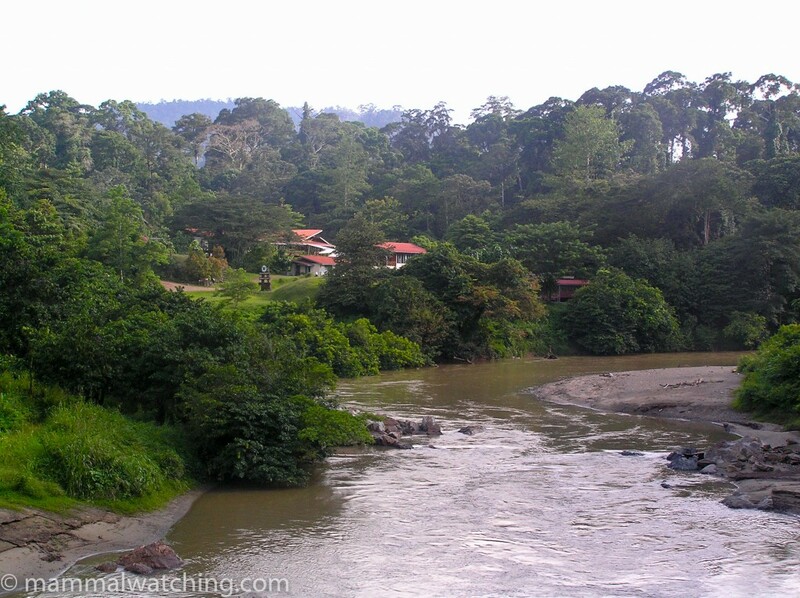 The forest bordering the park is disputed territory between the government, who are busy logging it, and the local Berawan people who claim it as their own. 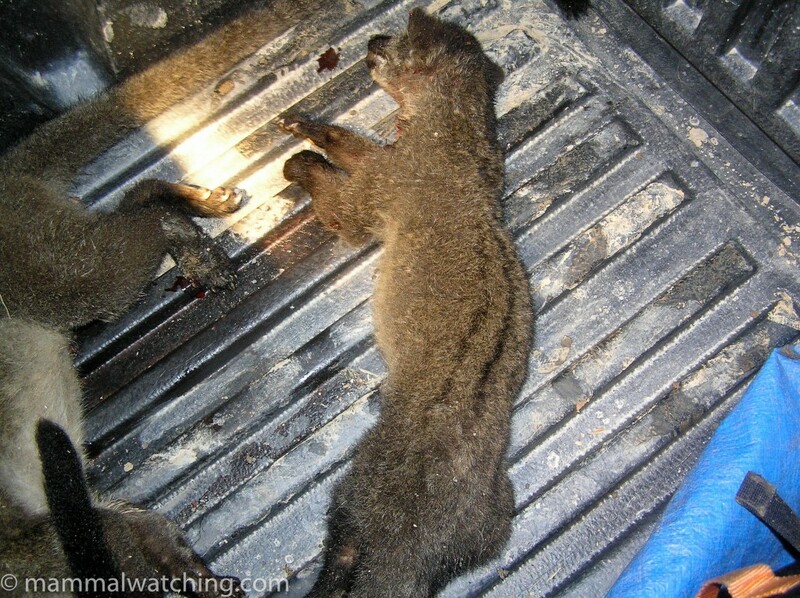 I went out on a hunting expedition with some of the villagers who, for a small fee, were happy to take me spotlighting in the back of a Toyota Hi-Lux so long as I didn’t mind them shooting most of what we saw, once I got them to promise that Sun Bears, Pangolins and Clouded Leopards were off the menu. The trip started well – in the first hour we saw four Small-toothed Palm Civets (two of which ended up in the back of the Ute), five Bornean Slow Lorises (not apparently good eating and left alive) and a Long-tailed Porcupine disappearing off the side of the road. But then a flat tyre, a flat spare and a broken foot pump (the seal of which was eventually replaced with the aid of a car mat, a knife and a candle) cut the trip short. The area sounds rich in mammals. 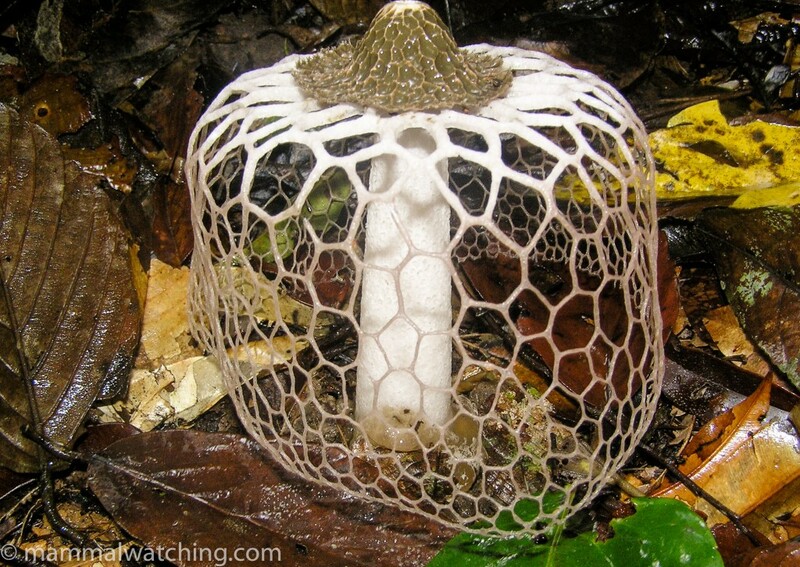 One of the guys had seen a Pangolin the night before. 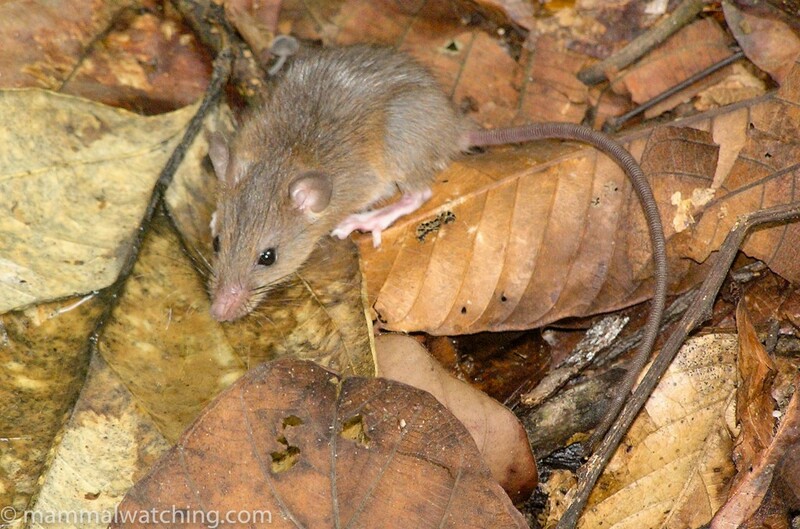 Tarsiers, Barking and Mouse Deer were apparently quite common. 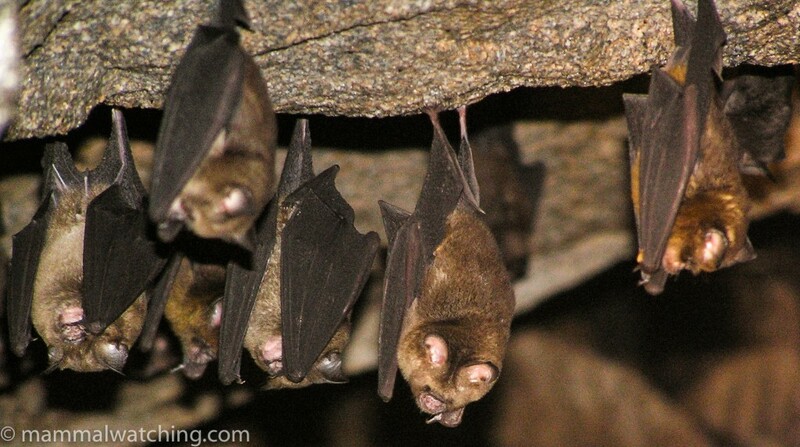 Other species I saw around the park included what was probably a myotis bat species. This very dark bat was flying circles under the bridge on the way to Deer Cave at 4 p.m. and skimming the surface of the water. I also saw a couple of Treeshrews (but only fleeting glimpses at dawn), Plain Pygmy Squirrels (a couple along the short trail to the helipad from the bat viewing platform), the Sarawak subspecies of Prevost’s Squirrel (one at the very beginning of the Deer Cave trail) and a couple of small to medium fruit bats that I saw in flight and couldn’t ID along with many microbats. I spent two nights here but needed more time. It is a fascinating area, and the walk up the mountain is something I want to return to do. During 36 hours at the Kinabalu HQ I saw quite a bit of stuff. 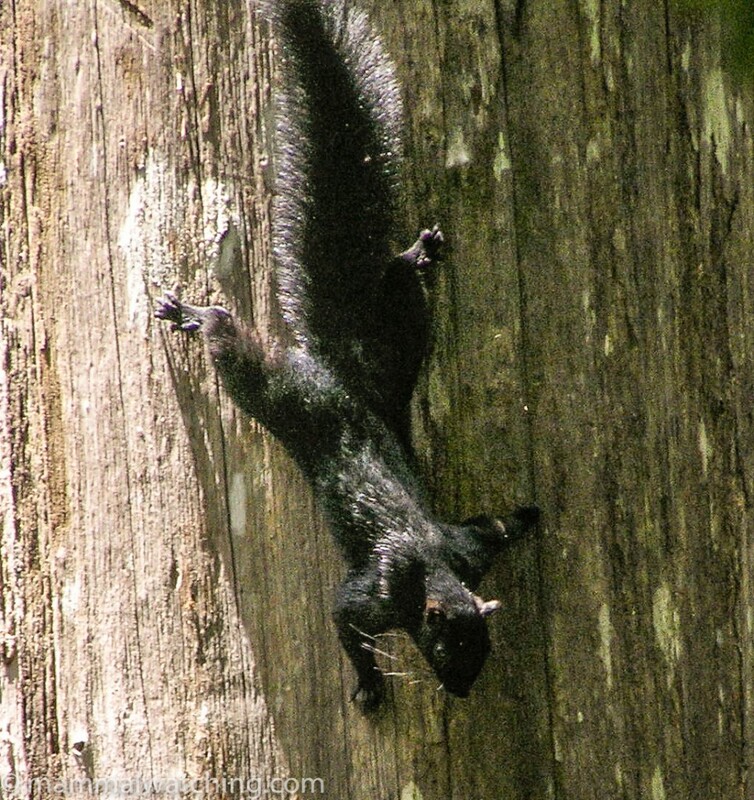 Bornean Black-banded Squirrels were around the HQ. Other people have reported Red-bellied Sculptor Squirrels and Whitehead’s Pygmy Squirrel from the HQ and surrounding trails but I was disappointed not to see them, and during a four hour walk from 6 a.m. to 10 a.m. I saw only one squirrel and that was in the first during minutes. 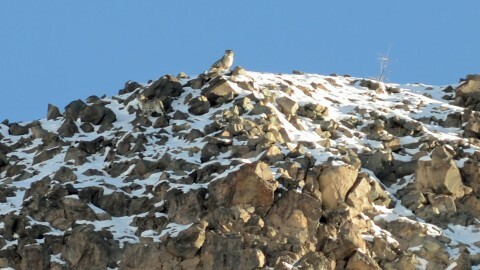 Malayan Weasels seem relatively easy to see here, and I saw one at midday on the road up to the summit. Great animals, especially if the idea of a dayglo orange ferret gets you going. About 50 metres before the Timphoon Gate at the end of the road up to the summit there’s a small dumpster (on the right hand side as you are going up). This attracted plenty of squirrels and treeshrews in the late afternoon. I saw Bornean Black-banded and Mountain Ground Squirrels here, along with Mountain Treeshrews and a possible Slender Treeshrew. Just before dusk a pair of Lesser Gymnures emerged from under the skip and after dark a pair of Giant Long-tailed Rats were foraging in the rubbish throughout the evening. A pair of what might have been Long-tailed Mountain Rats were raiding the smaller bins just before the locked gate (heading up to the summit) after dark, though this species is apparently extremely rare now so I am not certain of my ID. 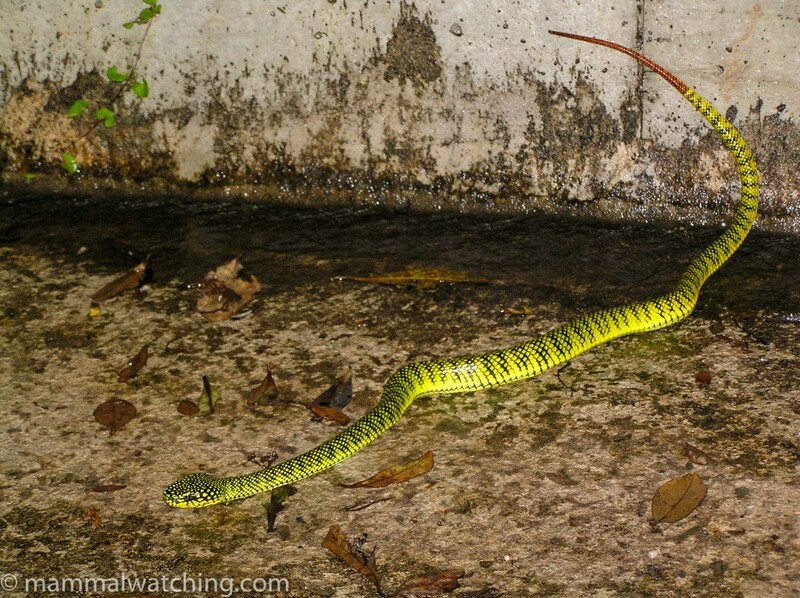 Driving down the road at night I saw a Kinabalu Pit Viper, which was a spectacularly coloured snake and apparently pretty rare. I did a little spotlighting around the park HQ and saw a Masked Palm Civet in a fruiting fig. I also walked a few kilometres up the summit trail in the mid-morning and teh guards were fine to let me go without a guide when I assured them I had no intention of climbing the mountain.The shelter stops along the trail are a good place to see squirrels. 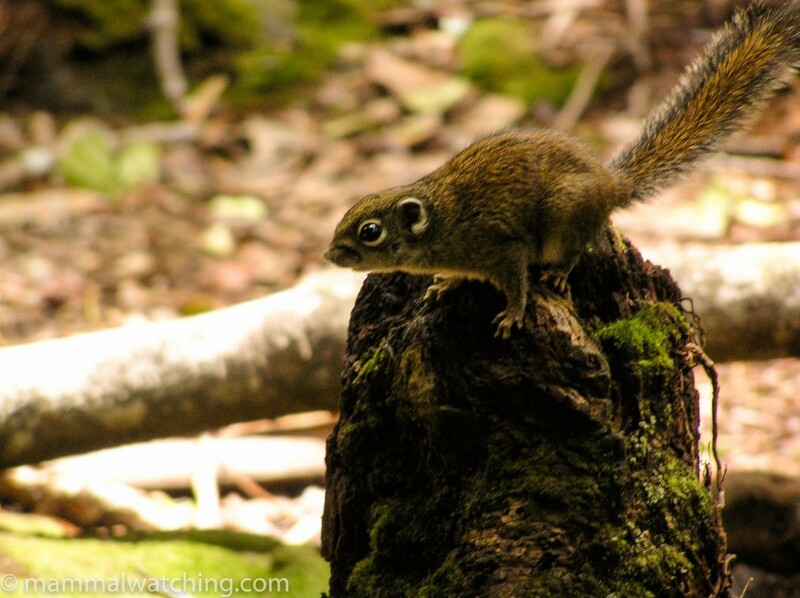 Jentinck’s Squirrels and Ground Squirrels were common at the first few shelters as were Treeshrews. 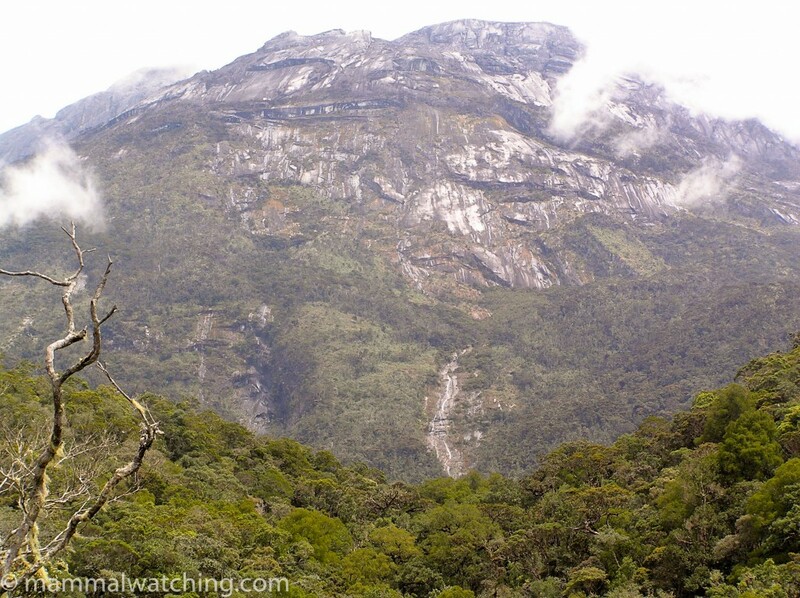 I was told that you had to walk a few kms further to see Kinabalu Squirrels easily and I didn’t have time. I only spent an evening and morning at Poring Hot Springs. From the sound of things it seems like a reasonably good place to see mammals, including pangolins. Spotlighting for an hour or so around the base of the canopy walkway trail, I found a Smoky Flying Squirrel and three Greater Pencil-tailed Mice (Chiropodomys major) running through the branches of various trees). In the morning Prevost’s Squirrels were everywhere in that same area, along with one Plain Pygmy Squirrel. Three Cream Giant Squirrels were active towards the end of the canopy walkway. I spent an hour at a bat cave that was a 20 minute walk from the HQ. 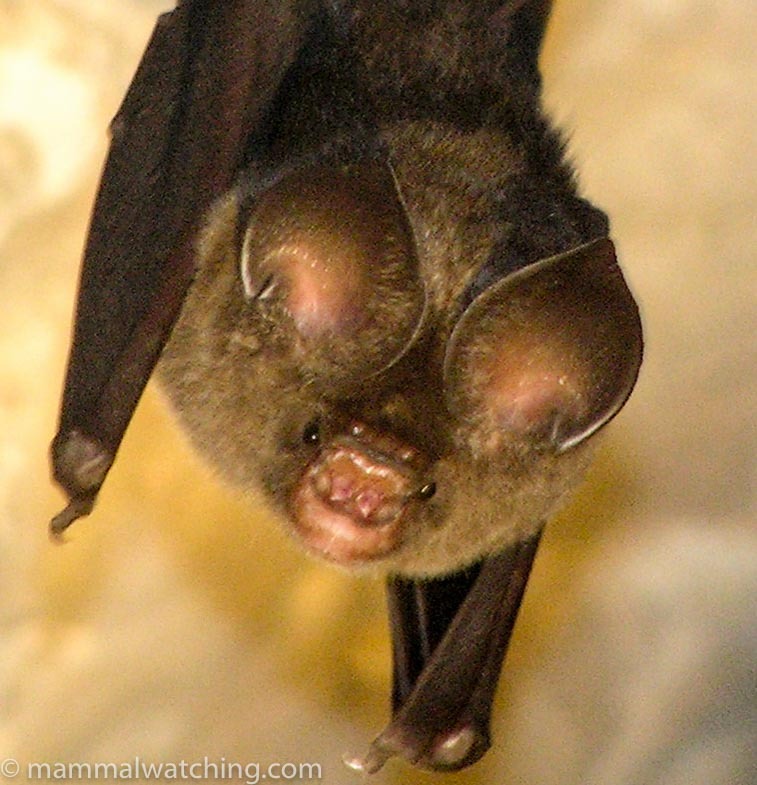 Fawn Leaf-nosed Bats were the main species there, but there were also some Sheathtail Bats (Embllonura alecto). The identities of both species were confirmed by Mr Assim, the chief biologist at the park, who was very helpful when I gave him a call. I spent a night here because several websites reported there were pangolins on this island just off Kota Kinabalu. A really cruisy place, with a spectacularly beautiful receptionist at the lodge, good food and OK snorkelling. But no pangolins (as I suspected). Funny how these rumours start. 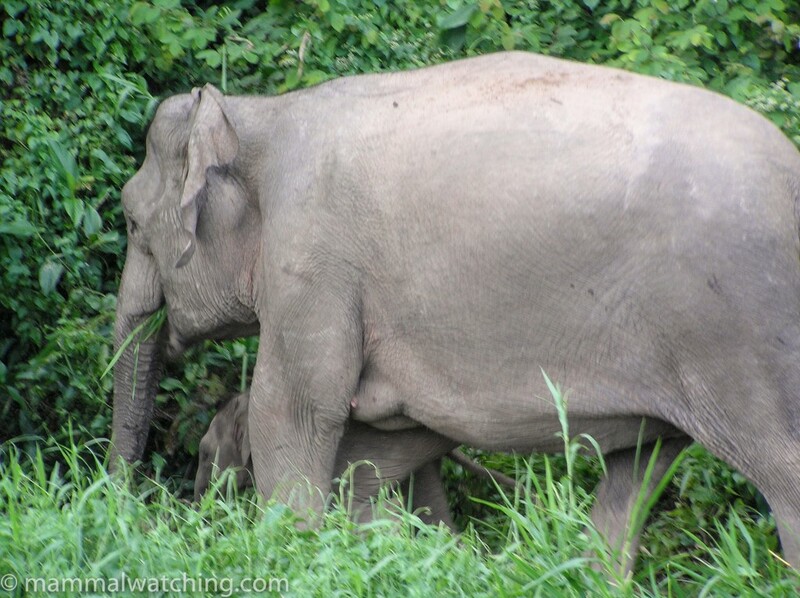 The Kinabatangan River is a superb area for mammals. 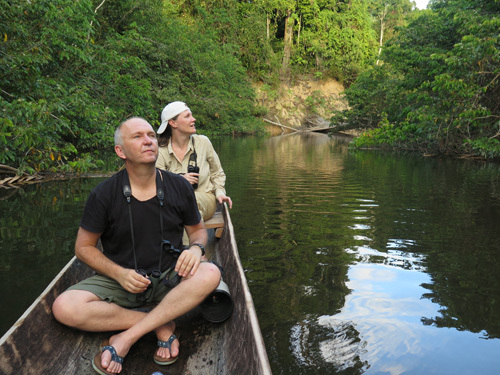 Most of the wildlife watching is done by boat: the long corridor of forest is so narrow that most of the animals have to be close to the river all of the time. I stayed at the Sukau Rainforest Lodge for two nights which was well run, with a nice patch of forest, complete with board walk, in their back yard. There was great mammal watching on the river and at the lodge. 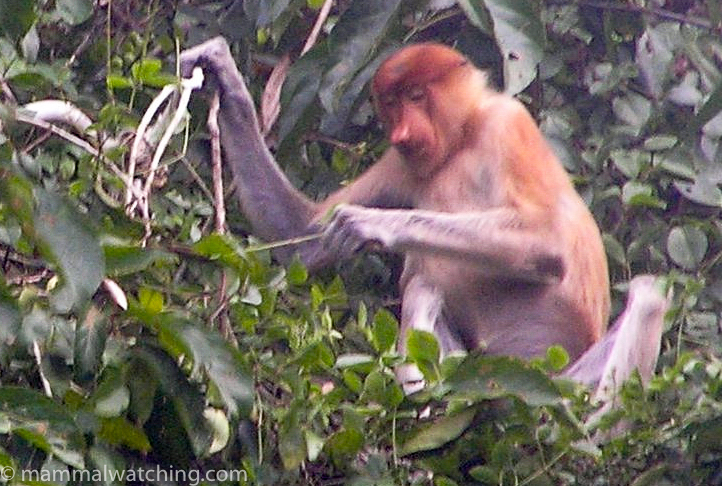 Proboscis Monkeys are common along the river as are Long-tailed Macaques. Orangutans are pretty easy to see too and most people see them if they stay for a couple of nights. Along the river I also saw Silvered Langurs (around the lodge feeding in a fig) , Asian Elephants on the river trip in from Sandakan (elephants are seen less often), Sunda Pig-tailed Macaques, Bearded Pigs (common), and a Colugo during a night cruise which I was told was quite unusual. Around the lodge there were Prevost’s Squirrels, Cream Giant Squirrels, Plain Pygmy Squirrels and a Horse-tailed Squirrel. From the boardwalk I watched a pair of Short-tailed Mongooses foraging at 11 a.m. and I saw a Malayan Civet at about 8 p.m. near the lodge. There was a Moonrat at 7 p.m. near the boardwalk for two nights running. Giant Flying Foxes were feeding in a fruit fig. 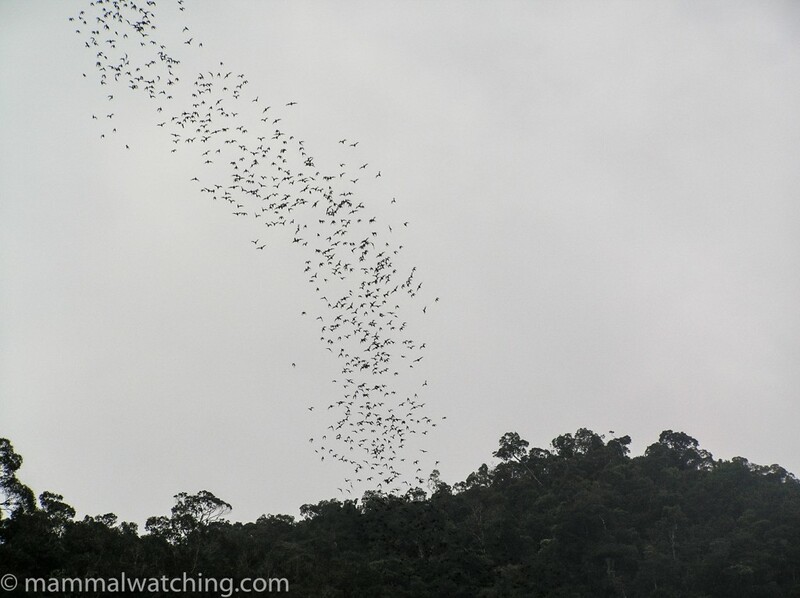 Some seemed smaller and could have been Island Flying Foxes though that may have been wishful thinking on my part. There were Dark-tailed Tree Rats (Niviventer cremoriventer) and Rajah Rats around the place too, along with some nice birds including a Storm Stork, and crocodiles and pythons. Highly recommended. 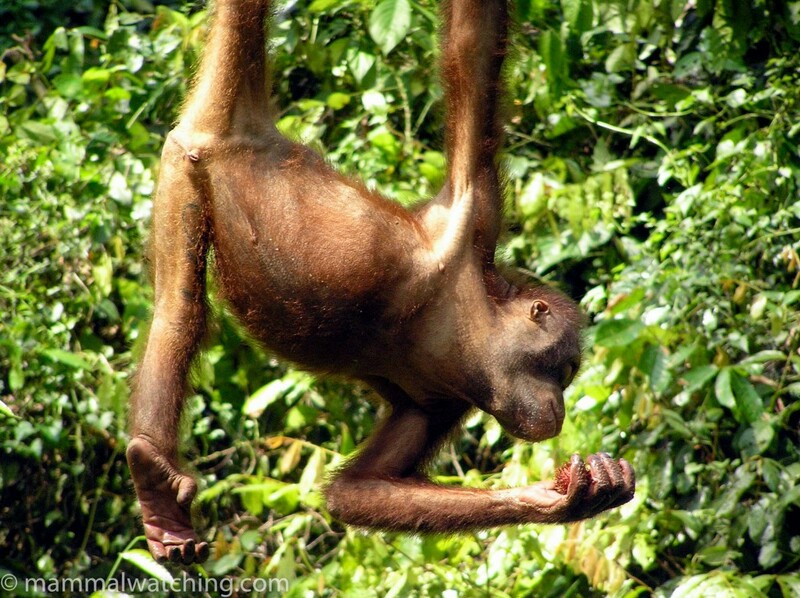 Most trips to Sukau begin at Sandakan and stop at the Sepilok Orangutan orphanage on the way. Wild Bornean Gibbons are here, but hard to see. 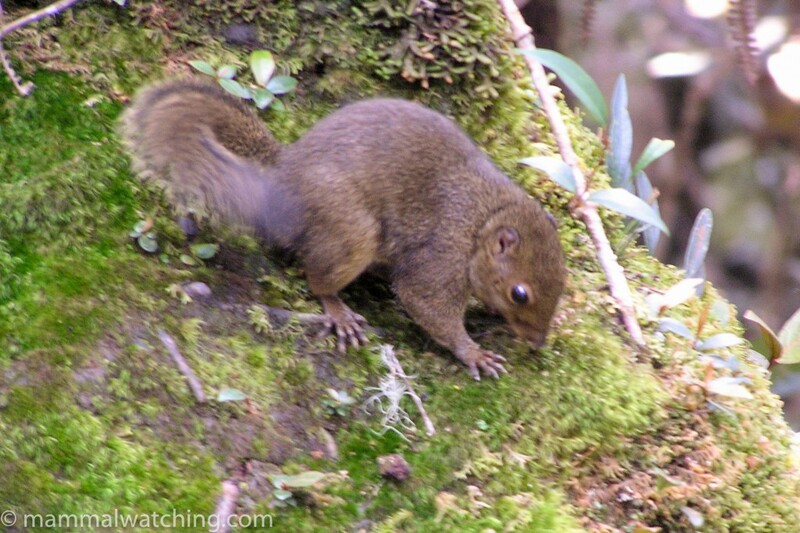 Easier to see are Prevost’s Squirrels (the predominantly black Plutonensis race) and Cream Giant Squirrels. They’ve also got a captive Sumatran Rhino that could only be visited in the mornings. Leaving the lodge we stopped at a small cave right on the river bank which contained many Dayak Roundleaf Bats (at least that is what I think they were) and perhaps other species too. We stopped in at the impressive Gomantong Caves en route to the Danum Valley. There were tens of thousands of bats inside but most are roosting too high up the walls to identify. But some must be Cantor’s Roundleaf Bats as I found a dead one. And many are Wrinkle-lipped Bats. 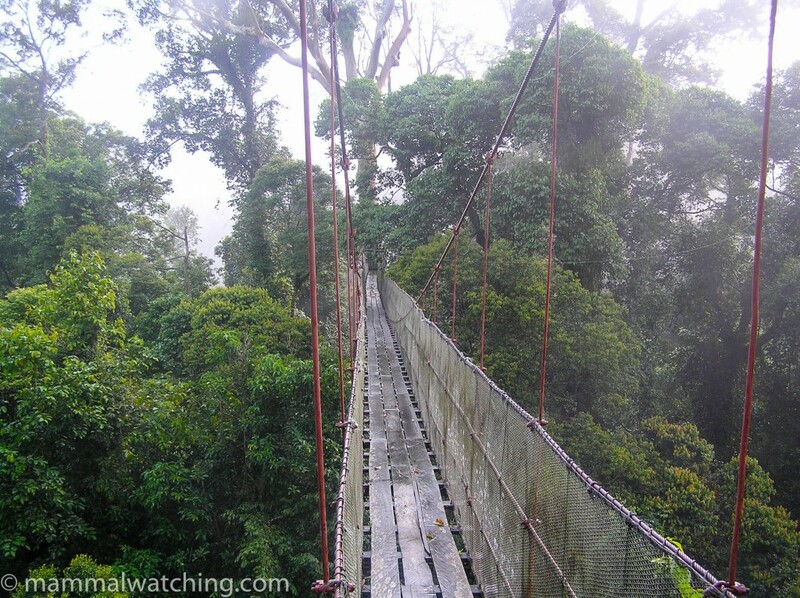 I stayed for four days in the Danum Valley and divided my time between the Borneo Rainforest Lodge (2 nights), and the Danum Valley Field Centre (2 nights). 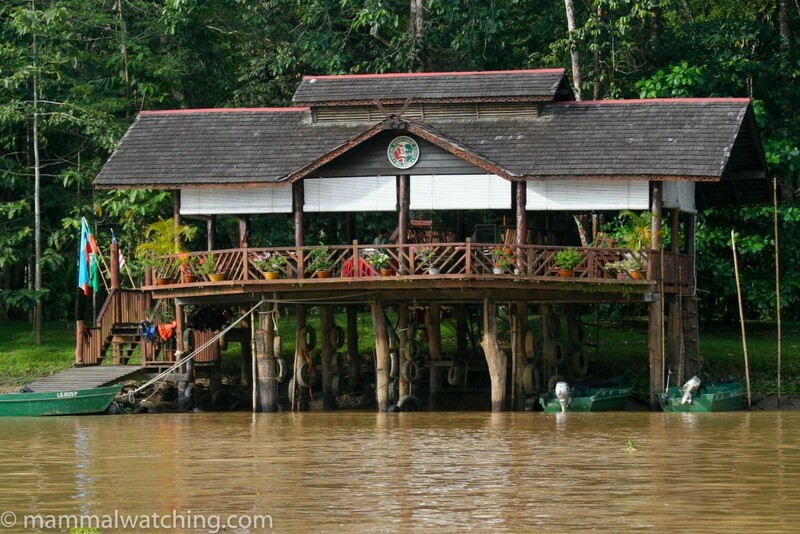 The Borneo Rainforest Lodge (BRL) is quite luxurious and expensive. I found it an irritating place because of their many and peculiar regulations. They insist, for instance, that you walk the trails with a guide. Although there were only six of us staying there, I had to share a guide for half my trip which meant four of us were walking the trail together: not ideal for finding wildlife. Moreover, the other guide and his group was walking precisely the same trails at the same time as we were. I’ve no idea why. Though the Malaysians seem to like to do things en masse. The standard night drive, which is included in the daily rate, lasts an hour or so and goes up the lodge drive to the gate and back. If you stay at the BRL you should be sure to arrange an extended night drive, though the price for this was very expensive at 150 ringit ($60) per person per hour. This seemed a good deal higher than what was usually charged and also was subject to some confusion. There was, however, a good deal of wildlife around and the BRL seems a much better place to see Clouded Leopards for instance than the Field Centre. Pygmy and Prevost’s Squirrels were common around the lodge, as were Bearded Pigs and both Greater and Lesser Mouse Deer. I saw several groups of Maroon Langurs along the trails, and heard Bornean Gibbons both mornings. I spent most of the daytime looking for Short-clawed Otters, also pretty common by the sound of things, but I couldn’t find any. The standard night drive picked up a Colugo, Malayan Civet, Small-toothed Palm Civet and a couple of Flying Squirrels (one Giant Red and one Thomas’s). The next day I booked an extended night drive, and headed out just after several hours of torrential rain was stopping. This was one of the best night drives I’ve ever done. Five minutes up the road – in a large tree opposite the canopy walkway – we found a juvenile Bornean Clouded Leopard about 20 metres up in the fork of a tree. We watched it for 20 minutes but mum didn’t appear. Although Clouded Leopards are reported fairly often here they are by no means common. It was only the second my guide had seen in 5 years. Once we got onto the main logging road there was an animal every 500 metres. We must have seen 10 Malayan Civets, several Small-toothed Palm Civets, a couple of Leopard Cats, a Masked Palm Civet, a couple of Red or Thomas’s Flying Squirrels and a Long-tailed Porcupine. I imagine that the sopping wet forest meant the animals were choosing to travel along the road. I would have happily continued for several hours were it not for the exorbitant fee. But my dilemma was solved when the bulb in the spotlight blew. Western Tarsiers are often reported from around here too. I set a few Elliot traps around near the lodge but didn’t catch anything. 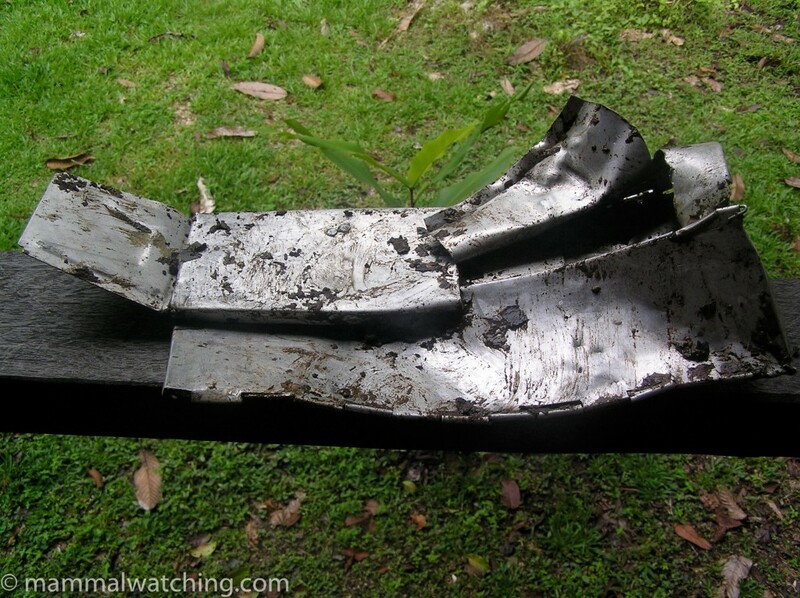 Something however – and I am guessing a Sun Bear, given Orangutans seldom descend to the ground – did terrible things to one of the traps. The Danum Valley Field Centre (DVFC) is a much cheaper option and probably better for many of the mammals other than Clouded Leopard. They are sometimes fairly strict about who can stay there and most of the guests are visiting researchers. Bona fide naturalists are welcome however, though you need to book in advance. Night drives can be arranged here and the camp staff patrol throughout the night recording animals and I was welcomed when I asked to join them. A Sun Bear had been hanging around for the past six months, occasionally raiding the trash by the hostel. It hadn’t been seen near camp for the a couple of weeks before my stay and I didn’t see it, though some people saw a Sun Bear in a tree only one km from camp while I was there. Other good animals reported reasonably regularly include Marbled Cat and pangolin. In the early morning I saw an Orangutan, Bornean Gibbons and Maroon Langurs along the nature trail. 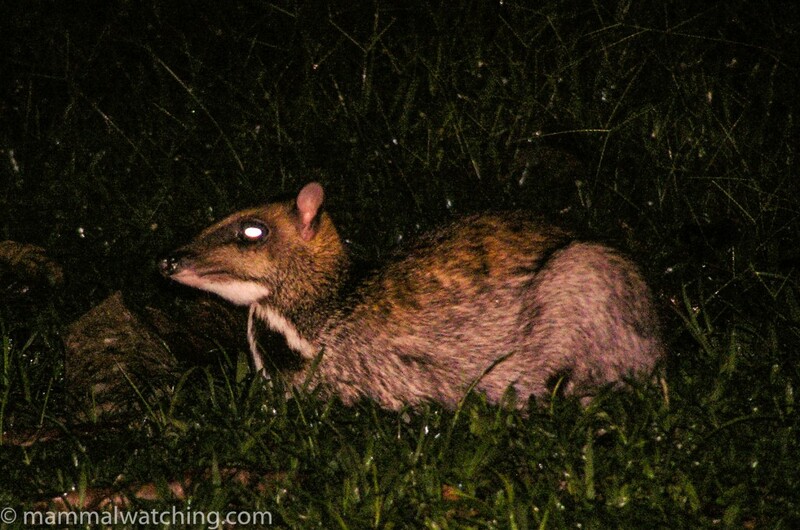 Bearded Pigs and Greater Mouse Deer were common near camp, as were Malay Civets and Bornean Slow Lorises. There were also the usual squirrels: Prevosts, Pygmy, Cream Giant and Horse-tailed. I didn’t see much on a night drive other than Red Giant Flying Squirrels and a Leopard Cat. On my last morning I helped a researcher check his traps for treeshrews. He’d caught a Plain Treeshrew (Tupaia longipes) [a recent split from the Common Treeshrew (T. glis) that isn’t found in Borneo] and a Large Treeshrew (Tupaia tana). It was great to get a decent look at these usually fleeting animals.